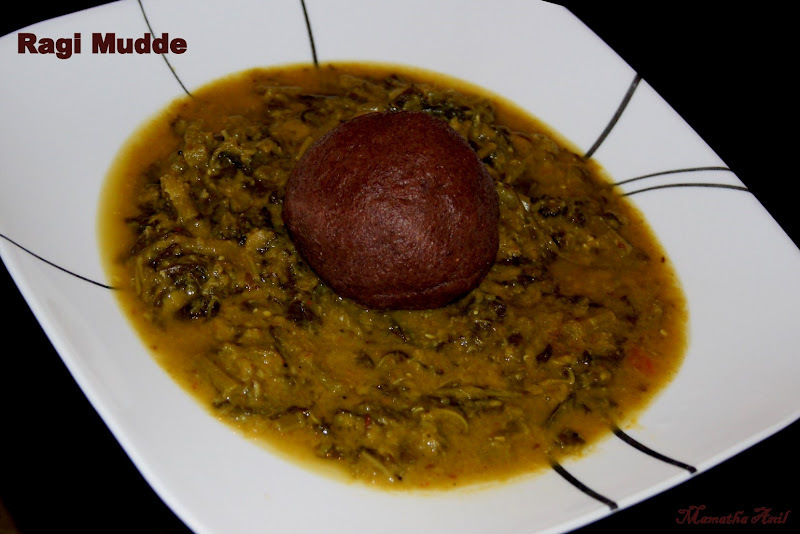 Ragi mudde is a popular healthy meal of Karnataka. 1. Take water in a vessel, add salt and oil. Let it boil. 2. Mix 1 tsp of flour in 1/2 cup of water and mix well. Add this to boiling water. Mix well. When the mixture thickens and forms bubbles add remaining flour. 3. Now take a wooden stick, mix well and keep stirring continuously in circular motion till it forms a single mass. (Make sure there are no lumps). It takes 4-5 minutes. Turn off the heat. 4. Now transfer the mixture into a plate. When the mixture is still warm wet your hands and make tennis ball sized balls and serve hot. 5. Nutritious(iron and calcium rich) Ragi mudde is usually served with sambar (bassaru-palya). Note: Most of the people don’t know how to eat ragi mudde. Take a small portion/piece of mudde, dip in sambar and swallow it without chewing. Ragi mudde is good for diabetic patients. 1. Boil 2 cups of water with little salt. 2. Take 1 tsp ragi flour in 1/2 cup of water and mix well. Pour this into boiling water and keep stirring. 3. Once the mixture thickens and forms bubbles add/spread a cup of ragi flour into it. Cover the lid and cook for 5 minutes. 4. Switch off the stove and stir the ragi flour till it mixes completely and there are no lumps. 5. Now make balls from the flour with wet hands.